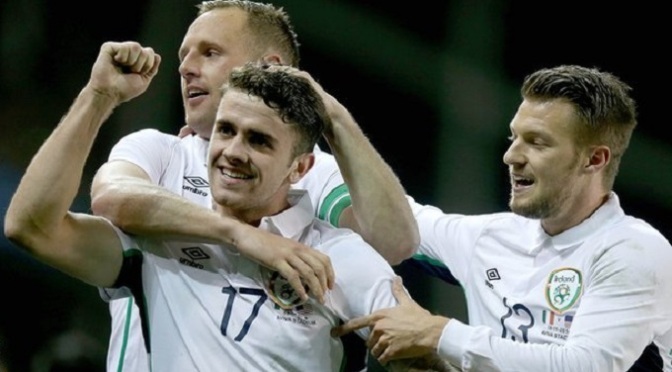 Robbie Brady helped himself to a superb double as the Republic of Ireland bounced back from their Euro 2016 disappointment to put the United States to the sword. Brady produced a deft 55th-minute finish and then dispatched a late free-kick to cement a 4-1 victory on a night when he shared the headlines with debutant David McGoldrick. Goals from Anthony Pilkington and Brady either side of half-time eclipsed Mix Diskerud’s equaliser. The defeat left Jurgen Klinsmann’s team winless in its last four games since reaching the second round of the World Cup. McGoldrick was involved in the first two goals in a team performance which went some of the way towards easing the disappointment of Friday’s 1-0 Euro 2016 qualifying defeat in Scotland. Ireland were in front with seven minutes played when McGoldrick announced his arrival on the international stage with a telling assist. The Ipswich striker played in Pilkington with a superbly-weighted pass and looked on as the Cardiff midfielder applied an assured finish to claim his first senior international goal. Daryl Murphy was denied a second goal by keeper Bill Hamid’s instinctive save, but Ireland found themselves playing on the break for much of the first half and finally succumbed when Diskerud levelled with 39 minutes gone. Goalkeeper Shay Given, winning his 127th cap, was grateful for the assistance of both the post and the crossbar as Fabian Johnson and then Jozy Altidore came close to beating him before the halftime whistle sounded. Given had to be at his best to keep out an Altidore piledriver five minutes into the second half, but it was the Republic who made the breakthrough once again when Brady made the most of more good work by McGoldrick to fire them back in front. Substitute James McClean extended the home side’s advantage with eight minutes remaining, but Brady capped a good night with the best goal of the game as time ran down.